It’s the most wonderful time of the year…Birthday Cake Time! While the rest of the world is celebrating Hanukkah, Christmas, Kwanzaa and the like…you know holidays involving winter, snow, lights…well, our house is celebrating birthdays galore! Both of my sweet daughters were born just a week before Christmas. It’s crazy town. But (as long as I can survive the stress) it’s lots of fun! Since their birthdays are so close to Christmas, each year I make them whatever birthday cake their little hearts desire to make sure their day is special and non-Christmasy. Anna is having a “Glamour Party” this year, which evolved into a “Hello Kitty Glamour Party” when she discovered the Hello Kitty plates and napkins at Target. So, a Hello Kitty cake it is! Hello Kitty by the way is an AWESOME subject for a cake. SO easy. Thank you, Anna! She was so cute this morning, staring at her cake the whole time she ate breakfast. 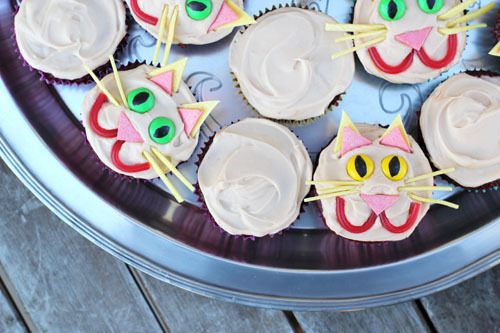 Cate picked out some kitty cat cupcakes from my favorite kids’ cake book. For some reason I thought Juicy Fruit was white. It’s yellow. So yeah, yellow ears and whiskers is what we got. I’m pretty sure Cate won’t mind! Because I would like to make this post semi-useful to you, I used regular buttercream frosting this year (adding a little cream cheese to the frosting for Cate’s red velvet cupcakes). And I most definitely did a crumb coat on the Hello Kitty cake (a thin layer of icing on the cake that picks up all the crumbs, followed by 10 minutes in the freezer before doing the final coat of icing). And for the kitty eyes, just use a food writer on M&Ms. Instant cat eyes! Happy birthday to your girls! Super cute b-day treats! 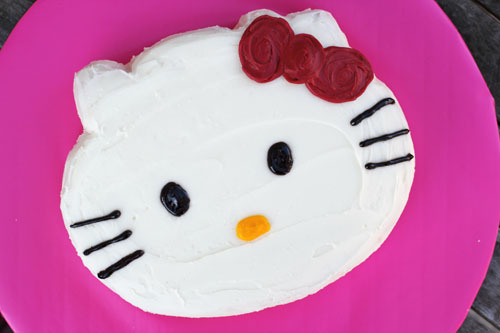 My friend loves Hello Kitty – this is an awesome idea (if only I were a little better at cake decorating…)! Happy birthday to your daughters! Jane, it is so great you give both of your daughters their own birthday, even during this busy season leading up to Christmas. Trust me they will appreciate it when they are older and understand. Plus they will not feel like they were cheated out of a birthday at Christmas time. Happy birthday to your girls! I agree! My birthday is New Years Eve and my mom always made it a goal that my birthday was totally separate from the holidays. Even to this day I treasure that. Your girls will really appreciate this more and more each year! My mother solved the problem by throwing a birthday party in February. I was born on Dec 26.
aww fun! my mom’s birthday is 3 days after christmas, and my sister’s is about 2 weeks before so i know how important it is to celebrate christmas and birthdays separately! Were celebrating a birthday around here too. My oldest son just turned 8 yesterday. Tonight we’re having 5 little boys over for our first attempt at a sleep over. With all boys I never get to make sweet cakes like yours. Today we’re having baseball cupcakes…also easy. I saw the cake on your family blog; it’s so cute! I’m going to pin it as soon as Pinterest is working again. Happy birthday to Cate and Anna! The cake and cupcakes are adorable. My oldest daughter and son have birthdays 4 days apart near Christmas as well, and we always try to make it special. They are 14 and 16 now and really appreciate how birthdays were always a big deal for our family. Making parties and cakes and special bday meals for them, although stressful in the holiday season, sure paid off. thanks for sharing the birthday love. too cute!! 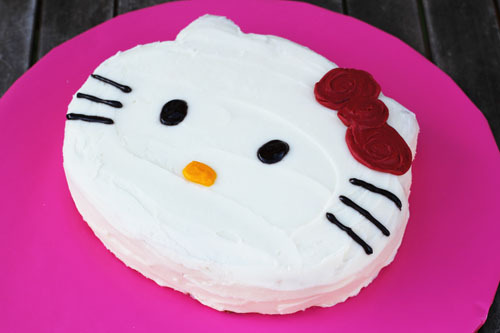 I love the Hello Kitty cake, my niece would love that! I’m definitely going to be taking a few tips from you with two birthdays right after Christmas here. A special day for themselves is so important. Belated Birthday wishes for your two little sweet daughters. 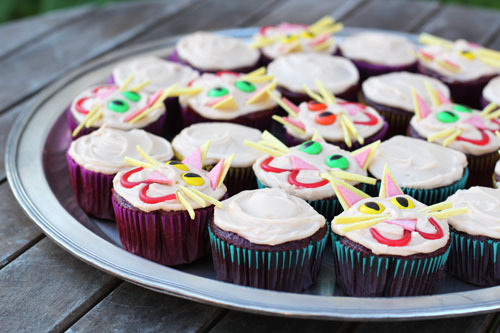 And i really appreciate you much to make these birthday cake (Hello Kitty and kitty cat cupcake) much more special. Oh boy do I know how you feel with Christmas Birthdays. My son’s birthday is Christmas Eve and my daughter’s is the day after Christmas. They will be 3 and 1 this year so we haven’t gotten into birthday parties too much but I know that will be changing very soon! How cute is that cake! I love cake decorating! Making my kids Birthday cakes is so much fun & there is nothing that can’t be done & it is way cheaper to do them yourself! Unfortunately this year has been hectic & my youngest 2 had cakes from the store. But, they are so used to getting whatever they want on there cake that for our small family parties they were choosing $60 cakes (1/4 sheet). I made the mistake of requesting them to add a carwash to my son’s car cake. They lady handed me a cake w/ nothing on it. And, when I asked for the cars that were supposed to be on there… they had none! Uggh! That is why I like making my own… no one to mess it up but me. My hubby’s b-day is right after Xmas, so they used to have a party in in July for him. My sister & had a b-day a week apart from each other so my mom would do our B-days together. Once or twice there were 2 cakes. I swore that when I had kids, they would never have a birthday together! So, of course for my wonderfulness my 3 kids B-days are all in a 1 month period! But, each have there own special B-day party (where ever they want), of course there own special cake & GIFTS. I know when we had the 2nd one… My MIL said “Oh, great you can have a double birthday party! I said NO! Hubby knows that will NEVER happen! Takes some extra plannin, but I wouldn’t have it any other way. Oops… it was supposed to say… “My sister & I have a birthday a week apart” And, takes planning… Uggh!